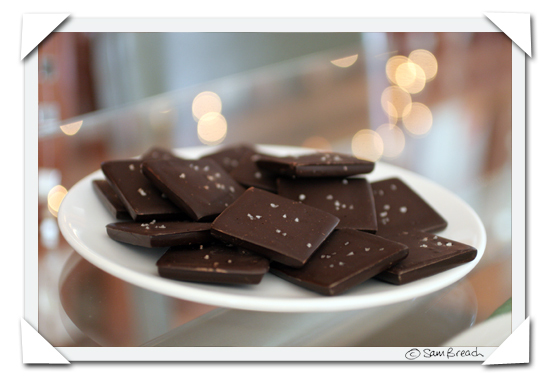 These chocolates, made only two blocks from my house, made it into the magazine: "“Poco Dolce sesame chocolate tiles take me to a new nirvana: Brittle sesame caramel is set within a generous slab of velvety dark chocolate, sprinkled with a dusting of sea salt.” Available at Bi-Rite Market (3639 18th St., 415-241-9760)" Actually - Bi-Rite don't have the tiles at this time as I discovered to my disappointment. Currently the only places you can get hold of them is at Poco Dolce's Online Store or at Yield Wine Bar. Pictured above are the caramel tiles. Insanely good too. Another 7x7 pick: “It’s hard for me to choose between the crème brûlée tarts and the walnut tarts at Petite Patisserie in Potrero Hill.” (1415 18th St., 415-821-9378) So for my party I ordered one of each. 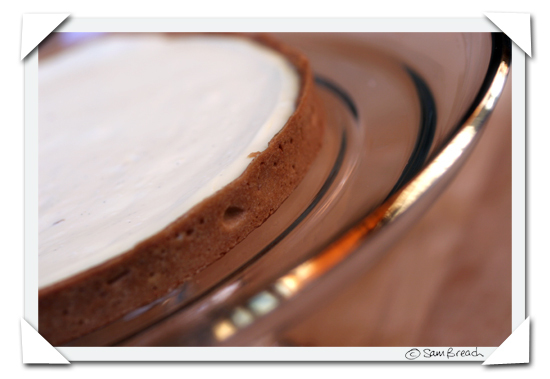 Pictured prior to being torched (they'll do it for you in the shop but I opted to do it at home just prior to serving) the Creme Brulee tart has nothing in common with the ubiquitous dessert you'll find on every unimaginative restaurant menu. It's perfect and the walnut tart is sticky good too. 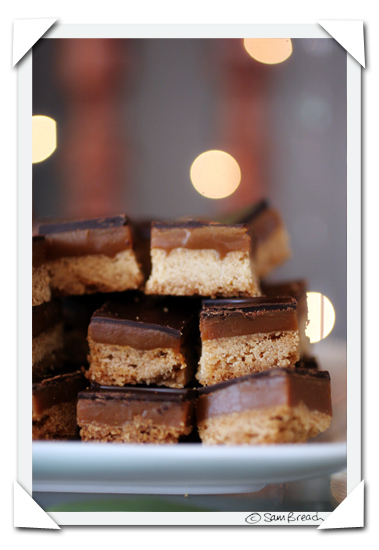 Although I submitted Clairesquares for the magazine - they sadly didn't make it into print. They certainly made it to my party though. Claire very kindly agreed to prep me a batch in bite-sized pieces so that they would make easy-to-eat finger food. As a surprise - Claire also presented me with a few pints of freshly made strawberry gelato studded with pieces of her chocolate flapjacks coming soon from a new venture, still to be named, in the La Cocina kitchens. I tried to get Tartine's glorious quiches into the article too and although that didn't happen, they made it into the bellies of several satisfied friends at the party. 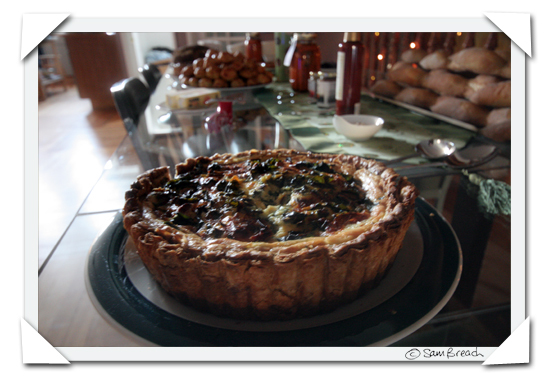 I could never make a quiche as good as these, the pastry is wonderfully flaky and the nutmeg-scented filling is fluffy, rich and decadent. Both flavours are excellent, but the changing vegetarian version usually has me going back for seconds more than the classic ham. It's a close run thing though. Fatted Calf Bacon was number 1 on the list of favourite foodstuffs I sent to 7x7 but it didn't make it to the line up, probably because they were featured last year. I also tried name-dropping June Taylor's tomato ketchup, which pairs exquisitely with it, to no avail. The Fatted Calf's bacon is something I eat in my every day life on a weekly basis, pretty much without fail, and it was the only item I bought for my party that required some cooking (I was trying to cut back on cooking and enjoy my own party for a change). But so laid back had I become at the thought of not being a slave to the stove, I apparently hadn't found time to prepare it before my guests started to arrive. Thank goodness, then, for the sweetheart who decided to get out the frying pan at 1am in the morning to cook it for the crowds. I also served some Fatted Calf pate and petit jambon. 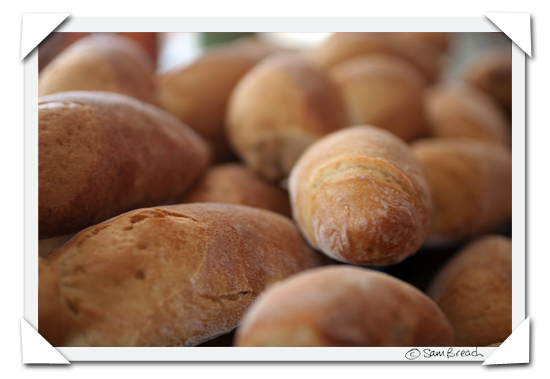 My favourite bread in the Bay Area to date is Acme's Pain Epi. We also served one of their large Pain au Levain (Fred's favourite). 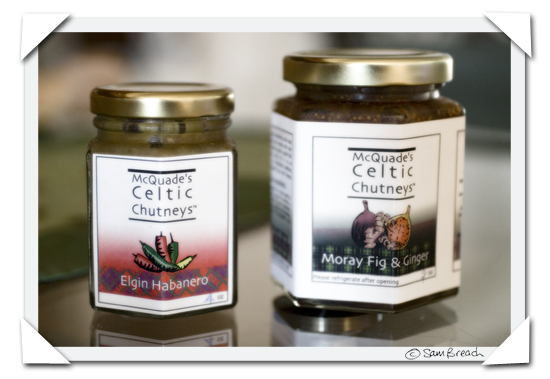 McQuade's Celtic Chutneys are a great accompaniment to the petit jambon in particular. 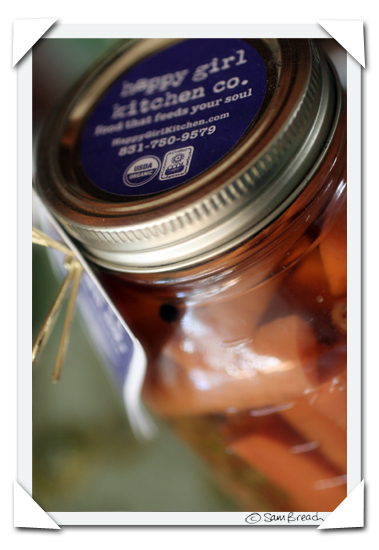 Happy Girl Kitchen's Pickled Carrots were also in attendance. I decided to buy a few bottles of June Taylor's Syrup as a mixer for the sparkling wine. 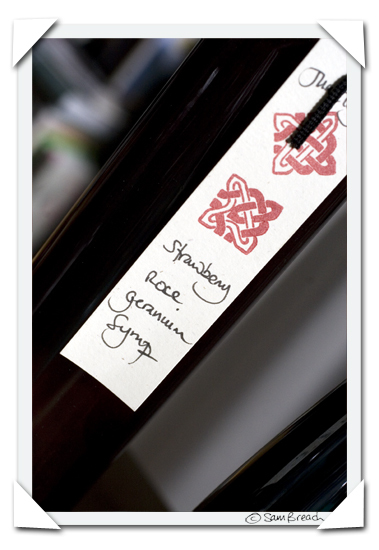 By far the most popular flavour was the summery strawberry scented syrup paired with delicate rose geranium. Just remembering its perfume makes me giddy at the thought. Strawberry and rhubarb was full of sweet charm too whilst the blackberry and lemon verbena was more subtle and understated. One point of my party was to share locally made, artisanal favourites with my friends. But when I ordered 2lbs (yes - you buy them by the pound!) of Gougeres from Tartine Bakery (they caught my eye when I was pre-ordering the quiche), I did so not knowing what they would taste like. 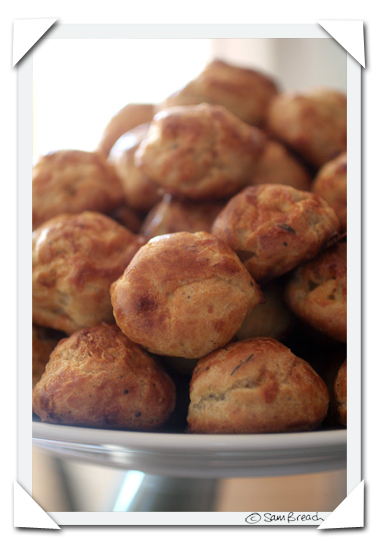 And it's not like I can't make gougere myself, if I put my mind to it. There is nothing quite like serving freshly-baked gougeres straight from the oven, but if you don't want to party in your pinny, then these are some shop-bought gougeres will allow you to entertain without the worry of last minute cooking. They worked for me, but Fred said they had too many spices in them for his French taste. Please note that Tartine's gougeres are considered a special order that needs to be placed at least five days in advance. It was a lot of fun thinking of my favourite San Francisco food things for the magazine and then being able to put my money where my mouth is by featuring many of them at a buffet for my friends. It was great to have the opportunity to share so much deliciousness, but I am sure this is just the tip of the iceberg, there must be so much else out there I am missing. If you were throwing a party where the only work you had to for it was do was to drive around town and pick delicious local things up, what would YOU serve? PS - And I just need to mention Bi Rite Creamery's mouth-watering, perfectly balanced Salted Caramel ice cream which I finally got around to trying this past weekend after reading this. It certainly would have made an appearance at the party too if I hadn't been kindly gifted so much of La Cocina's creamy strawberry gelato. I've been waiting for this ever since we talked about it - very cool. I have got to try that Bi-Rite ice cream on my next trip. The photo with the article is adorable! Everything looks so delicious I hope I get to try a few of these delights when I next visit!! If it hadn't been for the karaoke, I don't know if I would have been able to pull myself away from the clairesquares. My brain thanks you soooo much for introducing us, my gut however is not so pleased. Nice read Sam, and lovely to see your face too! You looked happy ;-) If I ever live in SF, I will have a ready list of places to visit! Thank you for including the chutney Sam! I hear the party was fun and that you have a great wee voice!!!! Great party Sam. I'm glad the Sweetheart was out and about and I hope he had fun. Don't know which photo Bea means but I can't see a picture of you on this post. In the last couple of years I've started buying in the dessert when I have people over. I used to be able to buy a chocolate tart from a French man that had a local restaurant but he's moved on and now I have to drive across town to a decent patisserie. Salted caramel ice cream...that sounds to die for! Sam, this all sounds beyond wonderful. That's the third recommendation I've heard for the Bi-Rite salted caramel icecream in a week. If I don't have an interview on Friday, I'm, like, there. Only one day after my birthday - my grandmother would spin in her grave if I didn't have some ice cream! She was quite a traditionalist about that! I had been thinking about going to Ici here in Berkeley again (definitely on my list of Best Nosh Around Town), but this sounds worth a special trip. I can go to Tartine while I'm at it. Is parking insane around there midday Friday or should I take BART? Beautiful post as always. Being a Thronton's and Green and Black's girl myself, those chocolates look divine! Did you see that Ryan Tate linked to your feature in 7x7 on his blog, Covers? I think he's got a crush on you. Love the twinkly light reflection in the first and third pictures - gorgeous! You always inspire me to "think local," Sam, and to dig deeper to find more local sources to love and patronize. We have a fabulous little Italian gourmet marketplace that has Prosciutto, Basil and Fresh Mozzarella Sandwiches on Tomato Foccacia. They slice the foccacia in half and turn it inside out, so all the tomato goodness is inside the sandwich. Wonderful, now I've a craving! There is also a great little wholesale bakery that has this Vesuvious cake that has these chocolate turrets on top made from truffles - divine. Wow Sam, leave it to you to leave my mouth watering just after eating breakfast! The flavor of that syrup sounds delicious. And anything sweet with salt in it is excellent in my book. Saw the Poco Dolce squares in Whole Foods (Harrison & 4th) today and gave in to the caramel variety - a girl just has to have an antidote to all that hard work at the gym! I get my Poco Dolce fix at the Peaberry's stand at the Market Hall building over here in Rockridge, and I have Clairesquares in the freezer for emergencies, as well as the HG carrots in the fridge, but great to hear about the others, will have to try them!!! Ohh great choice. I am getting pleasure by seeing your items. But i like very much 2no. chocolate.